First, we hope that China and Ethiopia will take the lead in political mutual trust. Both sides will continuously understand and support each other on issues concerning respective core interests and major concerns. The Chinese side firmly supports the Ethiopian side in blazing a development path that is suitable to its national conditions, and supports the Ethiopian side's efforts in safeguarding sovereignty, developing economy and improving people's livelihood. Second, we hope that China and Ethiopia will take the lead in the joint construction of the Belt and Road Initiative. Ethiopia is one of the first countries of the African continent to sign cooperation documents on the joint construction of the Belt and Road Initiative with the Chinese side. Leaders of Ethiopia also attended the first Belt and Road Forum for International Cooperation. The Chinese side supports Ethiopia in constantly playing the role of a bridge and bond in the development of the joint construction of the Belt and Road Initiative on the African continent. We welcome leaders of Ethiopia to attend the second Belt and Road Forum for International Cooperation to be held in China upon invitation. Third, we hope that China and Ethiopia will take the lead in cooperation in international affairs. Both as large developing countries, China and Ethiopia are facing complex international environment for development. 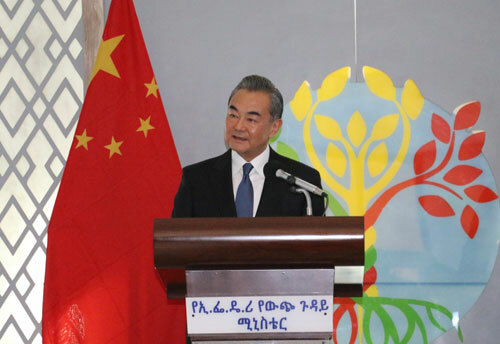 The Chinese side values the important influence of Ethiopia in African affairs, and praises and supports Ethiopia in pushing the situation in the Horn of Africa for major improvement. China and Ethiopia have conducted sound cooperation in the United Nations (UN) Security Council. The Chinese side is willing to continuously maintain coordination and cooperation in international and regional issues such as the reform of the UN Security Council, climate change, and the 2030 Agenda for Sustainable Development, in a bid to jointly safeguard the common interests of both countries and developing countries.